The big news of the week is, of course, the launch of the (kind-of) much anticipated iPad Mini. The smallest version of the latest Apple product weighs in at 0.3kg, 7.9” screen and is 7.2mm thick, and for the moment is available in a Wi-Fi only version. It’s thought that a 3/4G enabled model will be launched within the next month. With 16GB storage, the littlest iPad will cost £269 and will be available to buy in the UK from 2 November. As Xmas approaches, and with the upcoming Surface tablet from Microsoft, consumers will have more choice than ever before as to what device they buy, although none of them are hardly stocking filler prices. The iPad Mini competes directly with similarly priced tablets such as the Nexus 7 from Google and Amazon’s Kindle Fire, it will be interesting to see who wins the race this festive season, although my money is on Apple. This is purely because Apple fans tend to be very loyal to the brand more than anything, although it also has an excellent app ecosystem and iOS is considered to be 99% more secure than Android-based devices. Whilst the late Steve Jobs said that 7” tablets would be too small, Apple really have had to take this route if they want to remain dominant in the tablet market. 7” tablets are thought to be the best tablets for gaming and fit nicely into a handbag (or manbag, of course). “This new product from Apple will disrupt the market again. 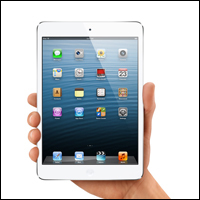 The iPad Mini is now the new category killer,” he concluded. He also predicted that the iPad Mini would help Apple to maintain a 68% share of the tablet market. Popular image-driven social network Pinterest has made it into the top 50 visited site in the US, according to comScore. The site had more than 25.3m visitors in September and it’s thought that the image-pinning site will soon surpass MySpace (which I personally am surprised is still up there), Instragram and Tumblr, which take place 47, 44 and 42 respectively. LinkedIn and Twitter are a bit further up the queue at 26 and 27, both enjoying almost 40m visitors in September. Pinterest saw huge growth this year and has become one of the most important social networks to many, and is growing all the time. Whilst it remains a site mostly used by the ladies, interest from gents and marketers is also on the increase. Recent estimates have found that around 12% of all internet users have a Pinterest account that they use regularly and the site has experienced a surge since it opened its ‘doors’ to anyone, rather than requiring users to request an invite. A recent Shopify study also said there is an ideal opportunity for eTailers to use the site for the upcoming holiday season. EE has announced its price plans for the new 4G service, which is expected to begin rolling out at the end of the month. It’s not cheap though and will initially be rolled out to ten cities, with six more to follow early 2013. For a standard contract, with unlimited calls and text and a measly 500MB download allowance, consumers will pay £36 per month. However, if you want to shell out a bit more for the 8GB allowance, then that will set you back £56 per month. The firm has also announced plans for ‘EE Film’ and a superfast broadband service which it claims will be “typically ten times faster than today’s standard broadband plans”. EE are the first to offer 4G services in the UK, which can be up to five times faster than 3G, as they already owned part of the spectrum necessary to run 4G. An Ofcom auction at the end of this year will sell off the rest of the spectrum to competitors, which was previously used for terrestrial TV. “We’re proud to be leading the way and pioneering the roll out of 4G in the UK. With our new brand and unique 4G and fibre services, we will deliver consumers and businesses across the country next-generation services and a superior level of support. Business customers get slightly better data allowances of 1GB, with prices starting from £35 per month plus VAT. “UK Businesses have shown considerable interest since our 4G launch intentions were announced. We hope that our new 4G plans and services will make us the most exciting digital communications business partner to work with in the UK,” Swantee added. German university researchers in Hannover and Marburg have found security flaws in 1074 (8%) of apps on Google Play (official). The researchers studied 13,500 of the most popular Android apps and found that the flaws rendered apps vulnerable to “man-in-the-middle” (MITM) attacks. Whilst Android remains the most popular mobile OS in the world, it has come in for heavy criticism from the security community, as the open nature of the platform and less than vigorous testing process makes it easy for cyber criminals to attack the platform. Whilst the study looked at the security of “benign Android apps that legitimately process privacy-related user data such as log-in credentials, personal documents, contacts, data, messages, pictures or videos,” it didn’t look at the growing number of malicious apps on the market, which often masquerade as genuine, popular apps, such as Angry Birds. A survey carried out during the study found that 50.1% of the 754 Android users asked said that they “did not judge the security session of a browser session correctly”. 55.6% of users also said that they had not seen a certificate warning and rated any risk as “medium to low”. This is due in part as to how important people perceive SSL certificates and permissions to be; many legitimate apps ask for permission to access the internet. The researchers built a tool to carry out the study said that “Mallodroid” may be able to be integrated into the Android framework in the future to address the problem. Well, we just had to really didn’t we?